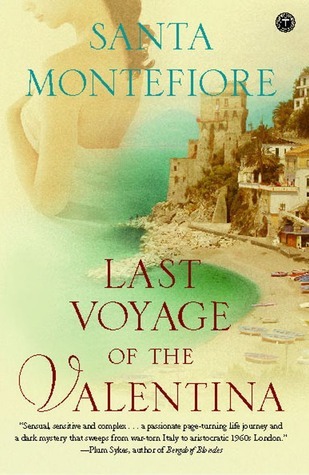 Heading to the beach in Amalfi for the first swim of the season! 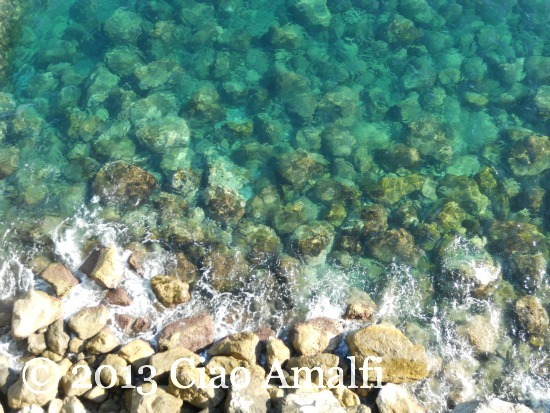 This spring has been an odd one on the Amalfi Coast with many days of rain and surprising chilly weather. When the weather finally got the messsagio that it was time for summer, the beaches went from empty to busy practically overnight. Everyone was eager for the primo bagno … or first swim. I’m not up to cold water temps so my first swim didn’t happen until a couple of weeks ago at the beginning of June. The water was quite chilly like it usually is in April or May, but that also meant it was still as beautiful and clear as it is in early spring. Just look at that turquoise! I must admit that I enjoyed the sunshine more than the swim since the water was still too cool for me to really enjoy. Just look at the boy wading into the sea in the photo below and his body language pretty much expresses just how chilly the water felt. 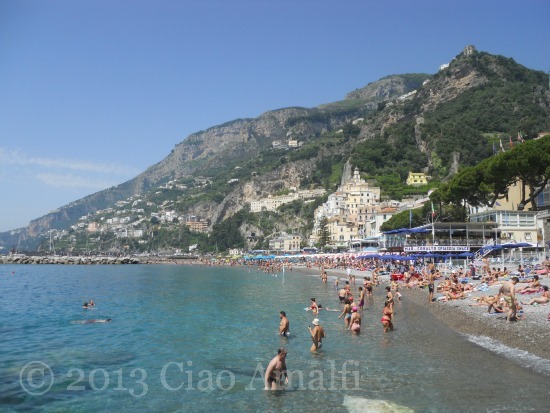 Either side of the Marina Grande beach in Amalfi has a free area where you can just throw down your towel. Or in between there are several places to choose from for a sun bed and umbrella if you’re staying longer and want to be more comfortable. Seeing as it was my first swim … and sun … we didn’t stay long. The recent scorching temps have warmed the water up quite a bit and it finally looks and feels like summer around here. The beach season has begun! 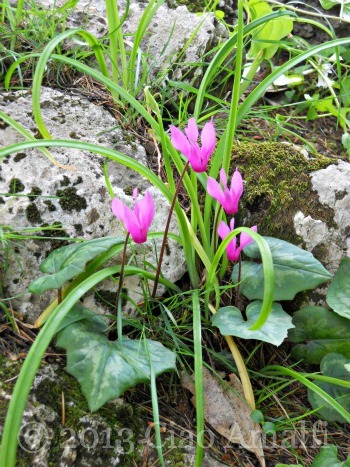 Spring came a bit late this year, but it wasn’t stingy with its beautiful colors and much needed cheeriness. 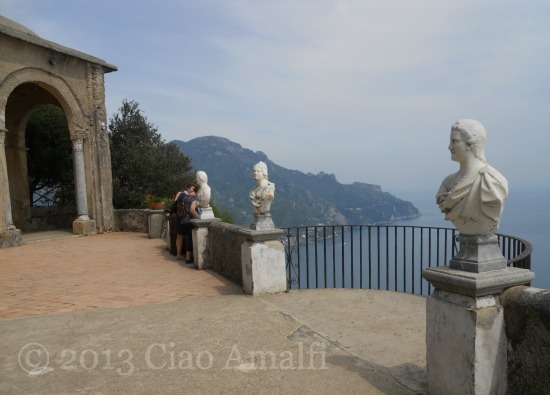 One sunny day when the internet went kaput I took a ride up to Ravello and headed toward the Villa Cimbrone. 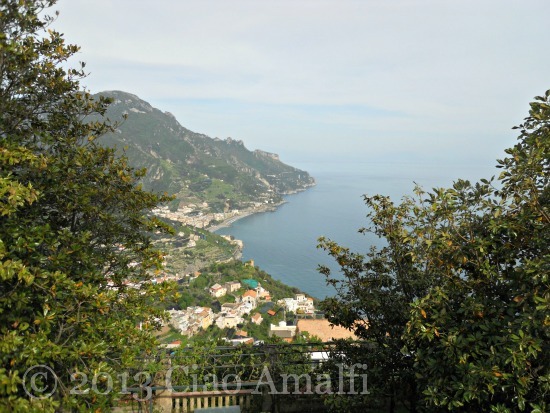 I’ve shared photos of a picture perfect autumn stroll through the Villa Cimbrone and a winter walk in Ravello, but I haven’t yet covered my favorite season of the year on the Amalfi Coast. 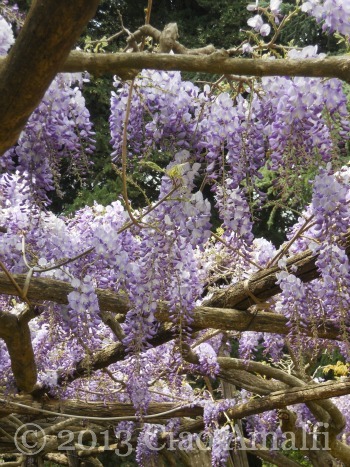 Bright bursts of yellow, electric pink blooms and, yes, there will be wisteria! 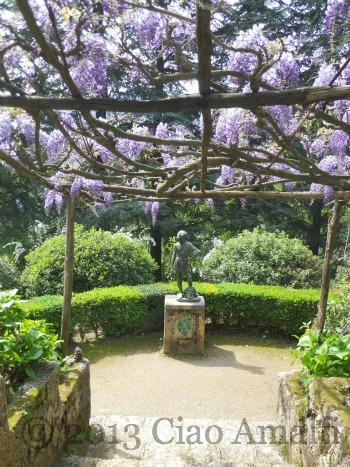 I try to visit the Villa Cimbrone each spring, but I’ve never managed to time it with the blossoming of the wisteria covered walkways in the garden. 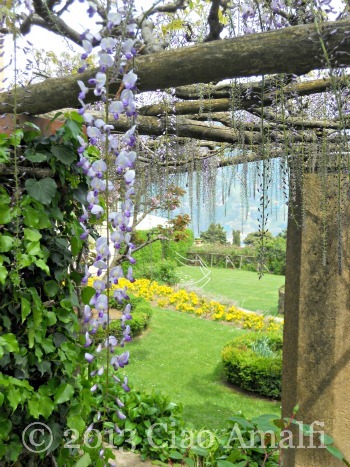 This year I was in luck as the much of the wisteria was at its peak. 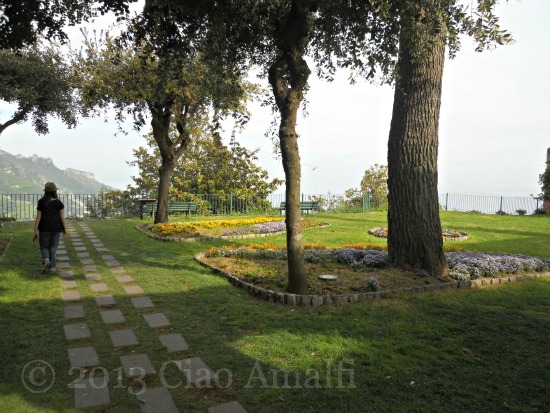 So just sit back, enjoy a cup of tea and savor the beautiful blossoms, garden setting and all the loveliness of spring at the Villa Cimbrone in Ravello! The Amalfi Coast is made of twists and turns with hidden away staircases, unexpected vistas out to the sea and beautiful spots to discover. If you’re the sort of traveler who likes to wander and explore, this is the place for you! 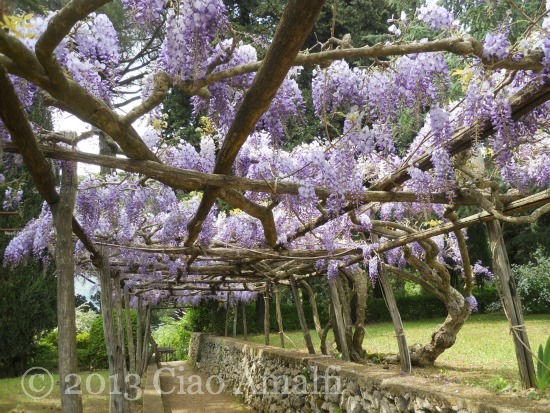 Ravello has two famous villas with gardens you can visit—the Villa Rufolo and Villa Cimbrone—but there are many other lovely spots to discover if you head out to explore the town. Strolling along Via San Giovanni del Toro just past the entrances to the luxe Hotel Caruso and the Palazzo Avino you will spot an arched stone entrance dripping with vines. Peek through the arch to catch just a glimpse of the view and it’s impossible not to walk in to explore the little Belvedere Principessa di Piemonte. 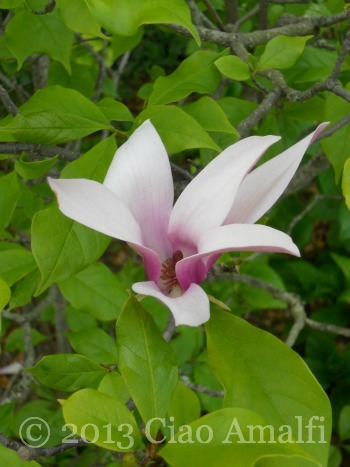 The small grassy garden is shaded with beautiful trees and planted with seasonal flowers. 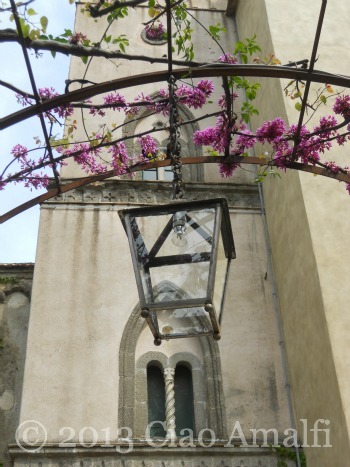 This is a very popular spot for weddings in Ravello since the city hall is just a short stroll away. There are some very well placed benches where you can sit and relax while enjoying the view. “Belvedere” means “beautiful view” – and that’s most definitely what you’ll find here! The view overlooks the Amalfi Coast with the picturesque village of Torello below and Minori and Maiori in the distance. The views here are very similar to what you would enjoy from the five star hotels nearby, but for free! 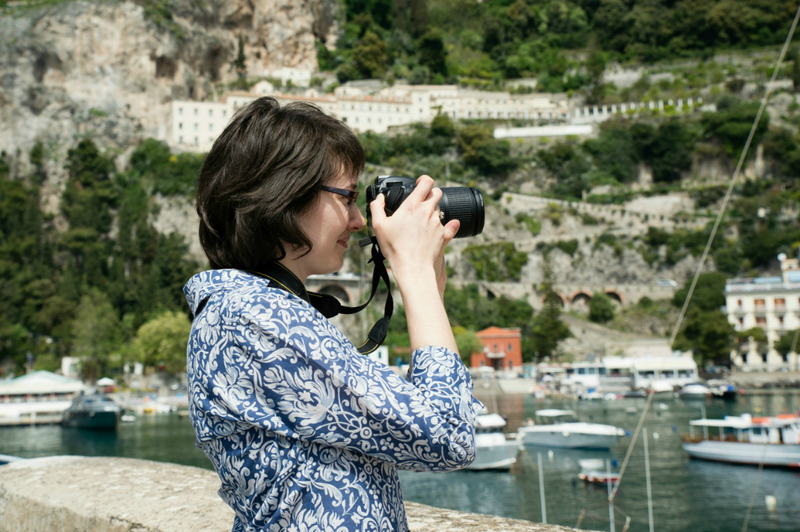 In many scenic spots along the Amalfi Coast you’ll find signs that indicate where famous movies were filmed. 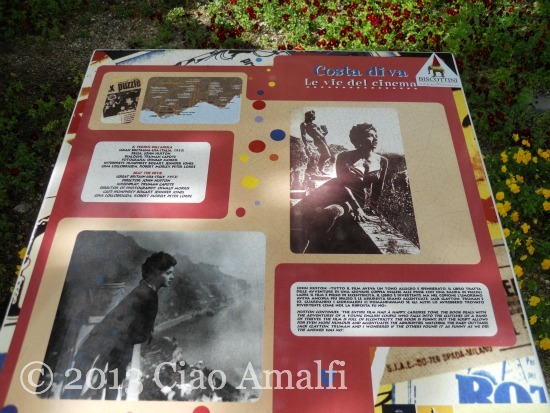 There’s a sign at the Belvedere Principessa di Piemonte about the 1953 movie Beat the Devil with Humphrey Bogart and the beautiful Gina Lollobrigida. The Belvedere Principessa di Piemonte takes its name from a real princess – Marie José of Belgium (1906-2001) who married Prince Umberto, the crown prince of the House of Savoy. Her title after marriage was the Princess of Piedmont, or Principessa di Piemonte in Italian. 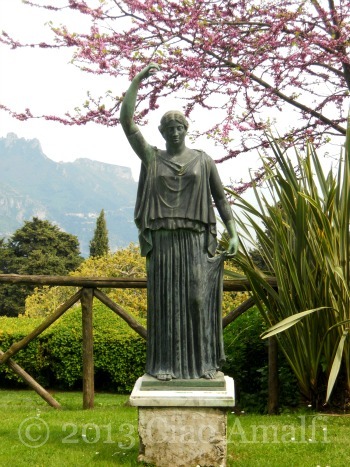 She became the last Queen of Italy in 1946, and her short 35-day role as Queen consort from May 9th to June 12th earned her the name “The May Queen.” In the 1930s, when what is today called the Ravello Festival was just getting started, the Prince and Princess of Piedmont attended one of the concerts in Ravello, and this belvedere was renamed Belvedere Principessa di Piemonte in honor of the princess. A view fit for a princess!